Wiesendanger Falls is east of Portland. On I-84, access to Wiesendanger Falls is a left lane exit appr. To reach Wiesendanger Falls climb up the switchback path (1 mile) to the top of Multnomah Falls. 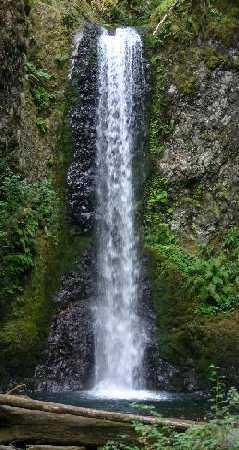 Total distance from base of Multnomah Falls to Wiesendanger Falls is about 1.8 miles. There have been instances where I've seen the name spelled with an 'ei' instead of the true 'ie'. I will let the plaque speak for his name.